Peace is breaking out, yet for some reason, Peace always seems to mean the expulsion or murder of Jews. I guess Peace and basic Human Rights for Jews don't coexist very well. Thanks to Jameel for pointing this out for me. As you know, the Jews of Hevron purchased a building they called the "Peace House". As they purchased it in Hevron (for around $700,000) it has created an international (and locally left) uproar. The Jews are expanding their Occupation. There have been many attempts to kick the Hevron Jews out of the building they purchased. The Left and the government are trying to get courts to get them out. Only one little problem. The building was legally bought - not that that matters to the Left. In fact, the army's Civil Administration, that looked into the matter in depth, told the government its official position - that the building was legally bought, and paid for and now belongs to the Jews of Hebron. But along with the Supreme Court they have decided to evict the legal Jewish owners anyway, as apparently the Minister of Defense refuses to sign the document that allows the Jews to live on the property they bought. Have you ever heard of anything so ridiculous. Last week, during the survey, I was asked if I felt that security for the nation was going to get better or worse in the upcoming weeks. I said worse. He then asked if I felt my personal level of security was going to get better or worse in the upcoming weeks. I answered that I thought it would be the same. I spend most of my time in the settlements (where it's safer), I’m armed. I’m trained. And how often do I have the opportunity to go to public places in Jerusalem, as of late? Of course, today I went to the Malcha Technology Park and the Malcha Mall next door, just as they were blowing up a suspicious object. While the news is reporting a high alert due to a suspected suicide bomber trying to reach the city, internal army radio seems to be implying that the bomber is already in Jerusalem and they are searching for him. The helicopters overhead put some credence into that report. I no longer felt that my level of personal security has stayed the same. I won’t ask the rather repetitive question of why every time there is a “Peace Conference” life just gets more dangerous. We know the answer to that. I no longer have any questions on this subject. I just wish they’d call me again with the poll. I’d like to change a few answers. I mentioned here that the after-effects of the upcoming Lebanon elections are going to be a big disaster for Lebanon. Well, even I can't follow what is going on there. Apparently, the pro-Syrian side (i.e. Hizbollah and other proxies), successfully blocked the elections for the next president (simply by not showing up to the required votes). As of Friday, at the request of the former president Lahoud (a Syrian puppet), the army is in charge of the government and it is reported that tanks are lining the streets of Beirut. Power should have gone to the anti-Syrian government of Prime Minister Fuad Saniora, but Lahoud refused to make that transfer (by declaring a State of Emergency). They are going to try to hold elections again on the 30th. This just looks like a another step backwards for democracy in the Middle East, as the Iranian sponsored Syrian puppeteer Assad still tries for his Greater Syria at the expense of lives of everyone in the region. As a first step against Iran, it's time to bring democracy to Syria. My name is on a list. Actually, I’m on a few lists, but this particular list is in question is in regard to surveys. You see, once you acquiesce to answering a survey once in Israel, you are put on the “do-call” list and you will get calls nearly every week with a new set of questions. Sometimes it’s obvious what they want, sometimes not. Sometimes the questions are relevant, and sometimes they are about nothing important (except to the person paying for the survey). This week I got a call, they asked a lot of questions regarding my perception of the IDF. Do I think it’s improved? Do I think the IDF is ready for war? Do I think decisions by senior officers are politically motivated or pressured? Do I think senior officers are corrupt? Do I think senior officers are qualified to fulfill their duties? Certainly, after the Expulsion I would say absolutely not. That was the most immoral act in the history of the IDF. Yet, was that what the question was really asking? What was the motivation behind that question. Usually when someone says the IDF is immoral, they are a Leftist and directly referring to the IDF’s defense of this country at the roadblocks or in the field. So here is a dilemma. Do I answer “yes” it is, as it was used immorally for the Expulsion, or do I assume that this is not even an issue in the minds of the sponsors any more, and they are referring to the defense of Israel, and then answer “no”? (Actually it was a scale of 1 to 10, 1 being least moral and 10 being most). What would you have answered (and why)? 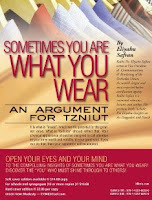 Rabbi Brovender's revolutionary WebYeshiva begins "zman" this Sunday, November 25. If you sign up now, there is a FREE 2-week trial with no financial obligation. The trial begins with the start of zman. All classes are held by video conferencing. Rabbis are available around the clock for questions. They have shiurim on various levels. Chavrusas. And more. I believe that during the free-no obligation trial, you get access to all the features and classes in the WebYeshiva program. 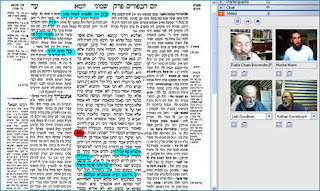 So if you are looking for a way to learn without leaving your chair/room/office/computer with rabbis and teachers who are INTERESTING - then check out WebYeshiva. It isn't just me, is it? I certainly hope that other people have problems with stories like this happening in the State of Israel, and idiotic comments like this coming from sectarian leaders in Israel. Something appears to be going on behind the scenes between Hamas and the PA/Fatah. Hamas is making moves to take over the West Bank, as well as to embarrass the PA/Fatah. Fatah/PA meanwhile is calling for an overthrow of Hamas in Gaza, and is busy arresting Hamas followers in the West Bank. So in return Hamas shoots up a bunch of Fatah followers on Arafat Day. But today there is a new twist. Hamas detained Jamal al-Dura (father of Mohammed). Inconsequential in of itself, until you remember that the whole shooting of Jamal's son was nothing more than a Pallywood production directed by the Fatah/PA government. Already Hamas has disclosed documents completely documenting Fatah’s/PA’a corruption and divergence of foreign donations to private pockets. Quite possible, al-Dura was arrested to send a message to Fatah/PA. If you keep arresting Hamas followers (and don’t let Hamas take over the West Bank) then Hamas will reveal what is already known, but still denied - that Israel did not kill al-Dura, and it was a PA/Fatah Pallywood production. That wouldn’t look so good for them, would it? What's up with the British Royal Family. 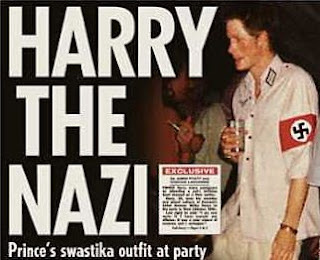 First we have Prince Harry, who thinks its amusing to dress up like a Nazi, and doesn't understand what the furor is all about. Now we have an anti-Semitic email that was leaked, written by aides to Prince Charles who have made it clear it is safe to assume that there is no chance that the Prince will ever visit Israel, so as not to "help burnish its [Israel's] international image". So, are they anti-Semites or just criticizing Israel? 10 days to elections in Lebanon. Will Hizbollah take over? Will it be another "Waksa"? I'm not a big Shas fan, and I don't think that one ever understands the actual motivations behinds the statements and actions of Shas politicos (is it money, is it religion, is it honor, is it money, is it influence, is it doing the right thing? ), but what I find most interesting is the Left's rather consistent reaction to Shas and how they actually avoid the issues being raised, when Shas raises them. Eli Yishai, for a few weeks now has been raising an issue, and the Left have been attacking him for it, but without actually answering what he is clearly implying. I wonder if he said it any straighter would the reaction be different. I doubt it. It’s not an issue of subtlety; it’s one of self-induced delusion. Ever since Olmert has said he is releasing Palestinian terrorists, Eli Yishai has repeatedly said that Jewish people who committed nationalistic murder should also be released (there’s a handful in jail). In fact, it seems that every time Olmert says his thing, Yishai says his in response. For this, the Left keeps calling Yishai a racist, and idiot, a primitive, unenlightened, an ignoramus, and I can keep going on with the adjectives being used. But I haven’t seen a single Leftist address the real issue that Yishai is raising. He is pointing out the utter hypocrisy of releasing thousands of Arab terrorists, who are statistics likely to commit even more serious acts of terrorism upon release (recidivism is the technical term), but then denying that same option to a handful Jews who committed acts of murder for nationalistic reasons against Arabs. The Left go nuts and says these Jewish killers can’t be released – it is immoral, but they have no moral problem releasing Arab terrorists, who are likely to kill even more Jews – because it is for peace, for confidence building, for whatever. It is as if they are incapable of understanding the very clear comparison he is drawing; and worse, it seems they don’t even understand the answers they are giving. Every time Yishai says this, it sounds like he is making fun of the left and his coalition partners, with a joke that is way above their heads. And all the Left hearing him say it (and even reading this) will give the same explanations of “Peace and Politics” every single time, while completely misunderstanding that every time they say this, they play the fool to his joke, and everyone on the Right sees this and either laughs or feels sorry for them (or sorry for us, as we all pay for their lack of comprehension). The problem is, it's no joke. Honestly, talking to a leftist is like beating a dead horse. In Ha'Aretz reserve soldiers returning from fighting in Gaza against Hamas are reporting some unsurprising news. Fighting Hamas is not like fighting terrorists, it's like fighting real soldiers, the reservist said. They're well armed, well equiped and well trained, said another. Ynet reports that Hizbollah is holding serious and professional military manuevers and training. And in fear that they will come under rule of their own, Palestinians in Jerusalem are applying for Israeli citizenship in the thousands. This makes it unclear as to why the Jerusalem neighborhoods should be handed over to the PA, when all those Arab residents will have fled to other parts of Jerusalem. In short, every single thing the Right warned and warns about has and is coming true. Yet the Left can't add 2 + 2, even when the news is reported in their own papers. Thanks to Jameel for pointing this out to me. If you go to Jameel's blog he has a video of the soccer game. "Dai l'Alimut" (End the Violence) was the slogan the Left kept using against the Right during the Oslo years as the government's policemen beat nonviolent Rightwing protesters and put them into hospitals. "Dai l'Alimut" (End the Violence) is the code that the Left continues to sling at the Right to end any possible verbal protest against Oslo and their latest adventures into "Peace". At this game, all the players wore on their shirts the Leftwing slogan "Dai l'Alimut". The announcer repeated twice at the "memorial" the Leftwing slogan "Dai l'Alimut" in memory of Rabin. So they have the announcer telling all the Beitar soccer fans that they are violent Right-wing extremists, using a phrase that the Left always throws at the Right in attempts to delegitimize and silence the opposition. If that's not a provocation, then I don't know what is. Sometimes Peace Now comes out with a report that makes me happy and isn't full of lies, distortions, and propaganda. Their latest is on expansion within the “settlements” and they are very upset. Among their list of growing and expanding "settlements" is the city of Ma’aleh Adumim, the town of Beitar Illit, and Jerusalem suburb Pisgat Ze’ev (that was the funniest one on their list – if you live in Jerusalem, you’d know why). I’m surprised they didn’t mention Gilo. The report said that hundred of new homes are being built. Hell, they don’t know the half of it. But unfortunately, from our point of view it isn’t fast enough. There is hardly a town or village in Judea and Samaria that doesn’t have high demand for new housing for the “Settlers” to move in to. Building isn’t happening fast enough to meet the demand, and the leftist-induced red tape we face that slows down the process is excruciating. Worst of all, none of the construction is “new” construction. All construction is based on completed permits that were granted 10-20 years ago that the Left have been holding up with their political influence and artificially inflated bureaucratic demands. No permits for new construction projects have been approved in years. By the way, Pisgat Ze’ev is within and part of the Jerusalem Municipality and was officially annexed by the State of Israel when Jerusalem was liberated and reunited. That Peace Now considers that neighborhood a settlement says more about Peace Now and the value of their reports than anything else. Treppenwitz points out a post on Daled Amos which refers to the ZOA site discussing Rabin's last speech in the Knesset. The ZOA article points out the following. Rabin ruled out uprooting settlement blocs, like the Gush Katif bloc in Gaza (which was subsequently uprooted by former Prime Minister Ariel Sharon): “The establishment of blocs of settlements in Judea and Samaria, like the one in Gush Katif. For all their talk about Rabin and his Legacy, if Rabin were to get up out of his grave today and say these things, the Left would denounce him as a Right-wing extremist. Yet these are the exact things he said, even though you can see from his speech that his positions are far left, even he had declared red lines, which shows how much farther left the left (including Olmert, Peres, Kadima, Labor, and Sheretz) have gone. Maybe next November 4th they should read this speech out loud at the Beitar games. But then the Lefties will boo. The National Jewish Outreach Program / NJOP is running a contest - and first prize is two (2) free tickets to Israel. A lot of good that will do me (actually, I'm not even eligible because you have to be in the US to enter). The contest's concept is actually quite interesting. They want you to send them a picture of some Judaica or family Jewish heirloom you own, along with a story describing its history, or why it is important to your family. The winner gets 2 tickets to Israel (did I mention that already)? Anyway. ENTER THE CONTEST HERE (and mention JoeSettler). I would have entered my silver kiddush cups that my father gave me that used to belong to my grandfather who brought them over when he came to America. But I'm not eligible to enter the contest because I'm in Israel!!!!! I stopped going out to the movies in Israel a while ago. You sit there, a captured audience. It was particularly bad at the Malcha mall (which also had problems with their sound system). You see, the Left decided that you shouldn’t be able to escape from their incessant attempts at indoctrination. So they bought commercial time before every movie (at that time for the Geneva Idiocy Accord). You go out to the movies, thinking you will escape from reality for a little while. You sit there and then suddenly a larger-than-life terrorist is standing there on the silver screen telling you that this latest peace plan to divide Jerusalem will bring peace. People used to practically riot in the theaters when they heard this nonsense being shoved down their throats. So I stopped going, rather than listen to indoctrination. This week at a Soccer game on November 4, the announcer called for a moment of silence in memory of Rabin. After 2 weeks of nonstop Rabinfest on the TV and radio, these soccer fans went to the game to watch a game, not to be told to be silent for someone they felt hurt them and hurt the country. These soccer fans are the people of the Machane Yehuda mall, these are the people that take buses to work, these are the people with family in Sderot. These are the people who got most hurt after Rabin and Peres brought the terrorists to Israel and the bombings started. The Left is now in an uproar. How dare they boo. The fans must be reeducated (perhaps electric shockers in the seats?). Their team must be punished for having fans like that. “This violence (sic) is unacceptable,” the Left screamed. They must be taught democracy. They must be taught about the Rabin legacy. They must be taught to be silent in face of the memory of what Rabin wrought. The team must be disbanded. All sorts of ideas were put forward by serious leftists. Educational pamphlets at games on Rabin’s legacy. Pregame speeches about democracy and Rabin. The players must be told to scold the fans not to boo at Rabin. They must be taught that they must be silent at the moment of silence for Rabin. I’m being serious. This is what is being said by leaders of the Left. One of the Beitar fans in an interview made a rather important statement. 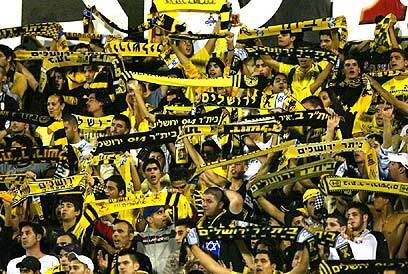 Another fan, said that mentioning Rabin at a right-wing bastion like the Beitar field is a provocation. You know. I wonder what would happen in Tel Aviv at the HaBima theater, if they called for a moment of silence in memory of another former MK who was assassinated by Arab terrorists (and you know who I mean) before the play went on. Would that be considered a provocation, and what about the reaction of that crowd? Anyway, we still live in a pseudo democracy, and that means free speech still exists, and if people don’t like hearing about Rabin anymore because they don’t like how the Left have hijacked his memory and history, and continue to bang the country over the head with him, in their attempts at indoctrination, then that is their right to yell boo. Trivia: Speaking of Rabin, Yigal Amir named his son: Yinon Eliyah Shalom . Everyone seems to have completely missed the significance of this name. If I recall correctly, the gemorah (Sandhedrin 98:b), mentions (at least one of) these names as (among) the names of the Mashiach. Amir has got high aspirations for this kid. I'm debating whether or not to discuss the latest 'reeducation' process that the Left is demanding the Right undergo, after fed-up Beitar Jerusalem fans were forced to hear (after a full 2 weeks of having it shoved down their throats) what they felt was yet another Left-wing political message, when all they wanted to do was to watch a game. Anyone want me to discuss it? Trivia: Before Rabin and Peres brought Arafat into Israel, created the PA, and armed and financed them with US and European support, there were less than 15 rifles in the entire Palestinian arsenal. After continuing debate within the Israeli government whether or not to temporarily shut off electricity to Gaza in response to Hamas Kassam attacks on Jewish settlements towns, Hamas decided to shut down electricity in Israel instead. A direct hit on power lines in Sderot resulted in the city being left without electricity. I can only salute the Gazans for their ability to state their goals and actually try to follow through with then. While the Israeli government debates punitive damages in exchange for murderous rocket attacks, the Hamas government decided to add punitive damages to their arsenal of attacks on Israel. So, the electricity continues to flow to Gaza, but no longer runs in Sderot. Like Nazis, the IDF soldiers violently and suddenly grabbed the Palestinian boy as he approached their West Bank roadblock. Viciously they threw him to the ground as the little boy struggled to break free. They smashed him into the ground as the boy struggled to free himself from the suffocating chokehold of the adult Israeli soldiers twice his size and number. “Leave him alone, he’s just a child!” yelled the Jewish women of MachsomWatch, the freedom fighters for the Palestinian abused, at the IDF soldiers hurting and abusing this young boy. “Let him go now,” the women demanded of the IDF soldiers now successfully holding the boy down so he couldn’t move and barely breath. The event described above happened last week. Personally, I would have put the boy and the women from leftwing MachsomWatch in a room together to see what would happen. You see, the Palestinian boy was a terrorist. In his backpack was a bomb, intended to be used against a Jewish target. But that is of little concern for MachsomWatch, who harass our brave and heroic soldiers who put their lives on the line everyday to prevent terrorists like this boy from reaching their desired targets. There is something self-destructive about the Israeli left that they let themselves be openly used as dupes for the enemy. Every day, members of MachsomWatch stand at roadblocks and prevent IDF soldiers from doing their job of ensuring that Palestinians allowed to pass through aren’t going to abuse this privilege to blow up and murder Jews. It is truly sick when the concern for the enemy exceeds the concern for your own. As I mentioned in a previous post (which I see is circling the Internet with amazing speed), there is a direct link between foreign aid and Palestinian terrorism. An interesting point that was raised was that when the Palestinians were unable to kill Jews (due to security measures), their violence turned inwards towards each other. Personally, I don’t differentiate too much between the different Arab terror groups like Fatah, Hamas, or Hizbollah. Their tactics may be different, but ultimately their long-term goals are the same. I think the events of this week best expose the truth of that statement. The Aska Brigade is the military arm (and part of the security service) of Fatah/PLO/PA and the “moderate” Abbas. They were trained and armed by the US for the purposes of “peace”, and promptly used their training and weapons to commit acts of terrorism. No surprise there. Once the Hamas terrorists took control of Gaza from the Fatah terrorists and cut off their source of funding, those Fatah terrorists were forced to find a new revenue stream. They now work for Al Quaida. That’s right. The Fatah terrorists trained and armed by the US, who continued to commit acts of terrorism while supposedly being the Palestinian “good guys”, are now using their training and weapons in the service of Al Quaida. If I was a US congressman or Senator, I’d be very concerned by this turn of events. As I personally don’t differentiate between the actions of one Arab terrorist group from the other, I have absolutely no problem with whoever is currently footing their bill. The goals are still the same, at best the tactics are slightly different. As far as religion is concerned, one is more fundamentalist than the other, but religion is a driving factor for all of them. But for those in the US that like to play make-believe and ignore Fatah (and therefore Abbas’s) acts of terrorism, they should be thinking twice about who they are funding. Unfortunately the (wrong) conclusion they will reach is that they should give more money to Fatah to bolster them and prevent the good terrorists from joining the bad terrorists, even though there isn’t a philosophical difference between them, which is why the jump is so smooth. I previously wrote about Peki'in here. The JP described the town as a model of coexistance. Since the riots there have been rumors flying around about some of the events that happened there. I decided at the time to not discuss those rumors, as at the time they seemed flimsy and unsubstantiated. The rumors involve a deliberate pogrom against the Jews, of Druse "nationalists", and more. One Jewish family had said, that while they knew of Druse "nationalists" in the town they thought they numbered a few dozen, not a few hundred. But masked Druse youths were caught on film specifically attacking and destroying Jewish homes after the police left. The youths were apparently even aware (and warned) in advance that the police were going to be entering the town. It seems that the cellular antenna was merely an excuse and a front. Are the events in Peki'in cause for larger scale concern for the State of Israel? Naftali... this one's for you. Apparently a post I wrote got picked up by a few big blogs and a ton of people have been visiting today. So... I'd like to welcome all my new visitors to JoeSettler. Right now it is important to get the message out that Jerusalem should never be divided again, though there are some creative analysts who say dividing Jerusalem isn't actually Olmert's plan for Annapolis. Instead, Olmert plans to give something else major away, while telling us how he saved Jerusalem. He could probably get away with it. Regardless, I have to work on the assumption that Jerusalem is in danger and let you know about it. For some nice pictures of Jerusalem check out the Streets of Jerusalem blog.